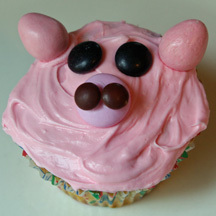 These pink pig cupcakes get their sweet, textured ears from sugar wafer cookies with waffle pattern. What You Need: 1 cupcake; frosting tinted pink; pink sugar wafer cookie; large pink candy-coated mint or similar pink candy; 2 blue mini M&Ms; white icing in tube or pastry bag; knife. How to Make It: Frost cupcake. Use knife to cut cookies into triangle shapes and place near top of pig’s head for ears. Pipe 2 white dots on pink candy for nose and place in center of face. Add M&M eyes. 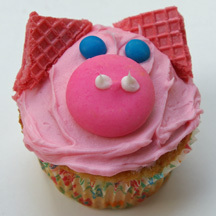 Here’s a pig cupcake with a nice, big snout. All of the decorations are candies, so no need for pastry bags, tips or piping! What You Need: 1 cupcake; pink frosting; 1 pink Mentos; 2 black or dark brown M&Ms; 2 pink Jordan almonds or candy-coated chocolate eggs; 2 brown mini M&Ms. How to Make It: Frost cupcake. Stick Jordan almonds near top of cupcake for ears. Use dab of icing to attach 2 mini M&Ms to Mentos for snout and place in center of cupcake. Add M&M eyes. 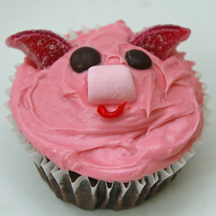 Make an entire pig body on a cupcake using just one metal tip! (Or, if you want to take it a step further, use a ribbon-type tip to make pointier ears). 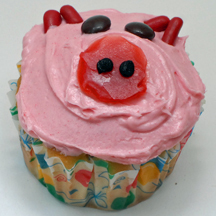 These pink pig cupcakes are perfect for a farm themed party or anytime! What You Need: 1 cupcake; white frosting; pink frosting; black gel or writing icing; candy eyes (or small candies such as mini M&Ms); pastry bag fitted with coupler and #5 metal tip. How to Make It: Frost cupcake white. With pink icing, pipe pig body, arms, legs and head. Pipe smaller “blob” of icing on top of head for snot. Add ears, pulling away to form points. Use black icing for nostrils. Add eyes. 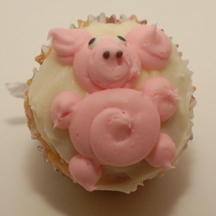 Whether you’re planning a farm themed party or just pigging out, these cupcakes will keep you in the pink. What You Need: 1 cupcake; frosting tinted pink; 4 candy-coated licorice pieces (such as Good & Plenty); 2 brown mini M&Ms; circle-shaped fruit roll (such as Betty Crocker Fruit Roll-Ups Stackerz); black writing icing or gel in tube. How to Make It: Frost cupcake pink. Arrange licorice pieces in 2 triangle shapes for ears. Add M&M eyes. Make 2 nostrils on fruit circle using black writing icing. Place on cupcake for nose.